It's not the world's first electric car, but the Nissan Leaf, launched in August, is the first fully electric vehicle built for mass production for the global market. To help drivers shift their thinking from gas to green, Japan's third largest automaker has about 30 partnerships worldwide focused on developing an infrastructure of battery-recharging stations to keep electric vehicles on the roads. The car's top speed is more than 90 m.p.h. (145 km/h), and its range is 100 miles (160 km) on a full charge. When it moves, it makes a futuristic sound like the flying cars in Blade Runner. 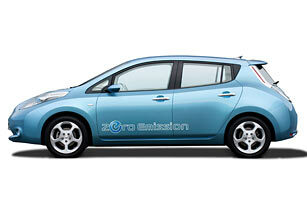 Nissan will produce 50,000 Leafs each year at its Oppama plant, southwest of Tokyo, starting in the fall of 2010.